Black Widow wins first women's contest by downing 40 dogs. 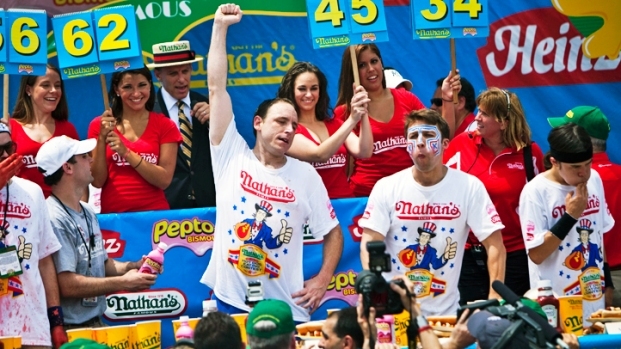 Reigning champ Joey Chestnut has scarfed down 62 wieners in 10 minutes to win his fifth consecutive July Fourth hot dog eating contest at New York's Coney Island. It wasn't his best, but it was enough to beat second-place winner Pat Bertoletti by nine dogs during the annual Nathan's International Hot Dog Eating Contest. Chestnut set a world record in 2009 when he put away 68 hot dogs. On Monday, he smiled, sweating as the competition ended, saying it was the "best crowd ever." In the first-ever women's contest, the Black Widow couldn't quite match Chestnut, but she put up a good fight. Sonya Thomas -- aka the Black Widow -- ate 40 hot dogs to win the women's event at Coney Island. She beat runner-up Juliet Lee, who managed to swallow 29 1/2 dogs. Nathan's officials say they introduced the women's competition because diminutive female champions like Thomas and Lee weren't getting enough of the spotlight. Both women weight about 105 pounds. Chestnut's nemesis, Takeru Kobayashi, was ineligible to compete because he won't sign an exclusive contract with Major League Eating, the fast-food equivalent of the NFL. He staged an unofficial contest on a Manhattan rooftop where he ate 69 hot dogs during the same time. He was arrested last year after crashing the show.